with a special 10-day event in 2019! Thursday, April 4 – Saturday, April 13, 2019. Each year, Just Creations offers a special 4-day Oriental Rug Event, featuring a collection of more than 300 handknotted, heirloom-quality rugs made by fairly paid adults in Pakistan. Sizes range from 2’ x 3’s to 10’ x 14’s, as well as runners in varying sizes. While we have a small selection of rugs in stock throughout the year, we host this special event once a year to bring a larger quantity and greater selection of rugs from the Bunyaad Rug Gallery at Ten Thousand Villages, Ephrata, Pennsylvania. These high-quality, fairly-traded rugs represent a win-win situation for all — a high-quality, fairly-priced, hand-knotted rug for the consumer and a fair-paying, consistent job for artisans. 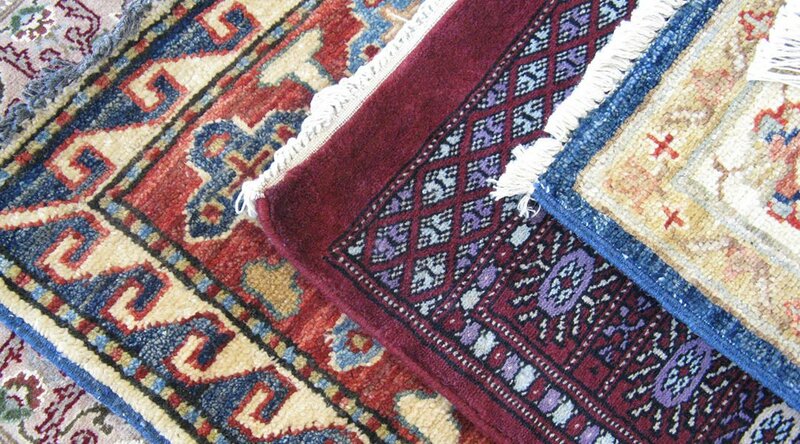 The rugs are purchased from Bunyaad, an artisan group in Pakistan. Centered around Lahore, Bunyaad was started in the late 1960s by a Pakistani Baptist pastor and rug artisan as a way to create and sustain rug knotting jobs in rural villages. Bunyaad works with both Christian and Muslim rug artisans, giving people the opportunity to work together, transcending differences of religion and culture. In this manner, Bunyaad is a peace-building project in addition to being a job creation project. Over the years, Bunyaad has grown to include over 850 families in more than 100 villages. These villages are located in two provinces, Punjab and Khyber Pakhtunkhwa (formerly the North West Frontier Province). The finishing center and warehouse are both located in Lahore, Pakistan’s second largest city. At Just Creations, we believe in a global economy that is sustainable and fair to everyone involved. This means providing well made, quality products for our customers and a fair, livable income for our artisans.